ThinkTQ - What Color is Your Performance? Home > What Color is Your Performance? "A racehorse that consistently runs just a second faster than another horse is worth millions of dollars more. Be willing to give that extra effort that separates the winner from the one in second place." ~ H. Jackson Brown, Jr. This is a "Members Only" area of TQ. For us to process your Test Results, and provide your FREE assessment, we must create a personal and private record in our database. Once registered, you will immediately be taken to your TQ Test. 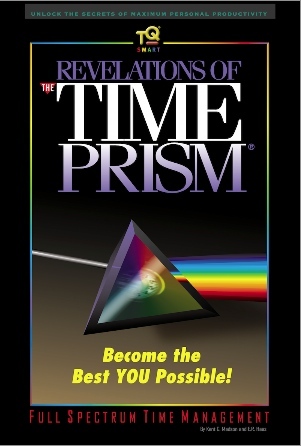 By becoming a new member, you will also receive our fabulous new, 136 page eBook edition of The Revelations Of The Time Prism: Full Spectrum Time Management. You will learn more about effective Time Management in this little book than in 20 years at the school of "hard knocks!" We will authorize your immediate access along with a free subscription to our Daily Lessons in Excellence. Why are we offering this $160 TQ Starter program FREE? We want to help you find lasting success and this is our way of introducing you to our entire family of TQ training products. Not for you? Cancel anytime. There's no requirement for you to purchase anything, now or ever. The download link for Full Spectrum Time Management will be sent to you via eMail, so please enter carefully. To qualify, all required fields must be completed. Any information you provide -- here or anywhere on our site -- is 100% private and confidential. We never sell, rent, exchange or give our customer information to others. Period. Site access and use subject to our Terms of Service. IMPORTANT: Please make sure to add us to your address book and approved sender list. If you do not receive our Welcome eMail in 5-10 minutes, check your bulk/spam folder and mark it approved. Never did I expect a web site to make me smarter. Never did I expect to wake up one morning and find someone to help me see my life from an entirely new perspective. You did both. Sign up for Today's TQ! New members get our Daily Lessons In Excellence training program absolutely FREE! TQ is an acronym for Time Quotient, a measurement of the actions you take to produce the Results you get over Time. TQ measures how smart you ACT, not how smart you ARE. ThinkTQ is the world's leading publisher of virtual training products for personal and professional excellence.